By Amit Patel. 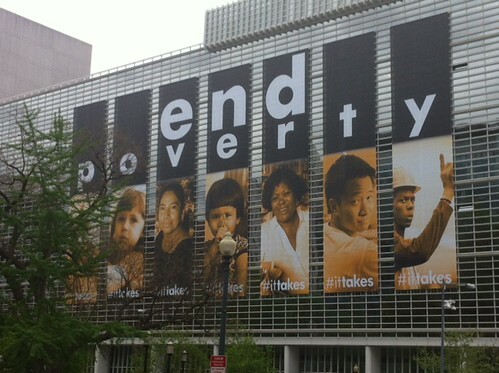 A few days ago, I was walking by the World Bank building and saw this huge banner that read: “End Poverty”. While there is no question about the righteousness of ending poverty, I started thinking about this question: do we know “how”? The hashtag said (whatever) it takes. Yes, but what does it take to end poverty? Or is it the inevitable global future for years to come? Today, I wanted to explore a few questions related to poverty that we all can relate to, and think about. Poverty has been recognized as a problem but has only exacerbated over time. There have been many efforts in the past to end poverty but then where did we go wrong? Is there any action that could change the direction of the world? You may already know that the Global Poverty project at the University of California, Berkeley explores such questions. Let me briefly introduce you to some of the key debates that Ananya Roy and her colleagues have raised. Roy’s arguments about feeling good about micro-philanthropy as a form of one more type of consumption are powerful. Consuming responsibly is a way to make the world that produces responsibly too, I think. I liked the way she questions the popular notions of ending poverty. Microfinance that was considered a panacea once is now a source of evil in many parts of the world including in the US. Haven’t you seen the shops that sell payday loans? I think it is time that we start questioning the very basis of our understanding of poverty and ask the fundamental questions about what creates such sharp inequalities in the first place. Cure is not enough to end poverty but we also need preventive measures. Postscript : I loved Ananya Roy and Tara Graham’s very novel approach to teach difficult concepts. I think digital media is very powerful pedagogical tool that is not exploited enough in higher education. Those interested in learning more about this initiative at the UC Berkeley, follow this link. Great post, Amit! I’m starting to write something about payday loans and other “alternative financial services” in DC, so this is very helpful.